A Californian whose ancestors lived in that state when it was still part of Mexico, Vonn Sumner is not one of the “build the wall” crowd. 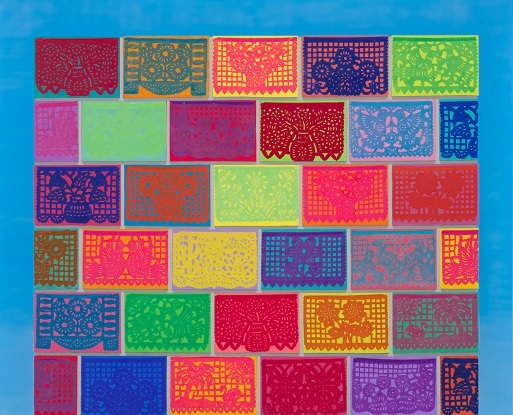 His response to that chant is the series of paintings in “Bread and Circuses (and Walls).” The biggest piece in the Morton Fine Art show, “A Big Fat Beautiful Wall,” stacks bricklike blocks of bright color, each rectangle graced with a traditional Mexican decorative paper appliqué. The painter also depicts barriers that almost hide the carnival-style festivities behind them. Updating a phrase that dates to Juvenal, who satirized life in Rome almost two millennia ago, Sumner paints jesters in colorful, bellfestooned hoods. Many of the performers have loaves of Mexican-style sweet bread balanced on their heads. The clowns look sideways at the edge of the pictures, skeptically avoiding the viewer’s gaze. They don’t want to join the circus parade. Sumner paints in a realist style, deftly employing modeling and shadow to simulate roundness and depth. Yet he intentionally simplifies, notably by using areas of intense, simple hues that suggest both comic books and color-field painting. The effect is to invoke universal forms — things that will outlast the biggest, most beautiful wall. Vonn Sumner: Bread and Circuses (and Walls) On view through Oct. 3 at Morton Fine Art, 1781 Florida Ave. NW. 202-628-2787. mortonfineart.com. Click HERE to view available artwork by VONN SUMNER. MEMORY IS CENTRAL TO VICTOR EKPUK’S ARTISTIC PRACTICE. IT ENCOMPASSES THE RECEIVED, APPROPRIATED, LIVED, AND IMAGINED. Victor Ekpuk’s creative process involves moments of quietude in which he digs studiously into his memory bank for visual clarity. The calm search for acuity, very revealing of the artist’s interest in human experiences, frames Reminiscences and Current Musings. In a way, this solo effort is a retrospective because it draws from several bodies of work produced by the artist between 1996 and 2013. The 20 works in the exhibition represent the artist’s meditations on his social experiences, drawing from Nigeria and the United States, his country of birth and residency respectively, and, as with most contemporary artists, other worlds that he has experienced in the course of several international artists residencies and exhibitions in the last few years. Memory is central to Ekpuk’s artistic practice. It encompasses the received, appropriated, lived, and imagined. It can be attached to a particular place to invoke Pierre Nora’s notion of Lieux de Mémoire , or a social experience that is conceptually articulated without claims to spatial specificity or a tangible context. Nora’s Lieux de Mémoire monumentalizes collective memory by rooting it in the concrete, in spaces, in gestures, objects, and images. Yet for Ekpuk, memory is a metaphor for unloading a stream of consciousness that is tied to either a specified or an unspecified social space. It is also a state of being; a meditative process of creative remembering of the personal and the collective. Using invented scripts and imageries that evolved from the cryptic nsibidi writing system that is autochthonous to eastern Nigeria, Ekpuk translates the human experience both transparently and symbolically. It is no secret that the nsibidi ideographic forms now function as a conceptual backdrop for him. Earlier on, he drew extensively from the writing system, as is evident in the paintings: The Three Wise Men (triptych, acrylic on panel, 1996), Heaven’s Gate (acrylic on prayer board, 2000), and Idaresit (acrylic on canvas, 2004). At that point, Ekpuk was more interested in aesthetic memory, the idea that one can subject a common cultural wellspring to rigorous formal analysis in order to create new aesthetic possibilities. Except one has some familiarity with the nsibidi form, the three works are open to multiple interpretations. They present what the art historian Chike Aniakor calls the “veiling of message [as being] the fortress of the artistic impulse.” The works may have specific messages, but they are not directly accessible and require the artist’s intervention in order to unlock them. Ekpuk has however become adept at inventing his own scripts, which may appear weighty in appearance, but are unburdened with fixed meaning. Unlike the nsibidi ideograms, Ekpuk’s inventions bear no deep secrets. Instead, they are outlets through which he articulates his perception of the world around him. In the artist’s oeuvre, his scripts recur in the form of dots, scrawls, contrived signs that are sometimes borrowed from pop culture, and few nsibidi signs which he employs more for their aesthetic value than for their significance. 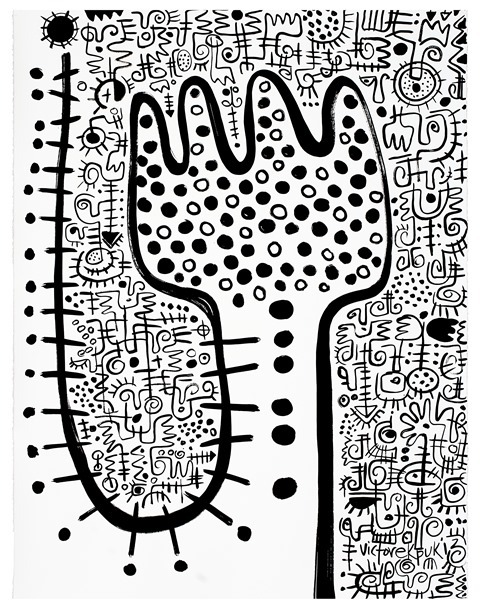 In 2006, Ekpuk had shifted his interest to drawing as his main channel of expression at the expense of painting in order to explore more vigorously the aesthetics of graphic signs as abstract forms. Altogether his scripts provide insights into a world of the artist’s making, a world that straddles the experienced and the imagined. Recent works such as Bicycle Groove (2012) and Santa Fe Sunset (from the Santa Fe Suite Series, 2013) directly address the artist’s time in Amsterdam, and Santa Fe, respectively. In the two works, Ekpuk adopts visual referents that lend themselves to fairly easy reading. Bicycle Groove explores a socio-cultural phenomenon of a place that the artist has experienced. In the piece in graphite and acrylic on Moulin de Larroque paper, a diagrammatic wheel stands as an avatar of Amsterdam, a city famed for its cycling culture. Ekpuk astutely assembles rudimentary forms and lines on the picture surface. He is effective in conveying his experience of Amsterdam without overloading the work. The work is also a balancing act in the use of negative and positive spaces and in the reduction of forms to their barest essentials, very much present in the artist’s other works. 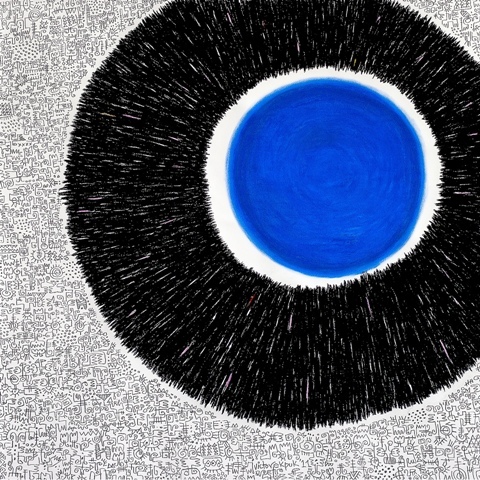 Ekpuk’s approach, which also highlights the innate and poetic quality of lines, allows him to maintain an ambivalence of engaging memory directly and symbolically. Santa Fe Sunset, produced in a recent artist residency in New Mexico, reflects this ambivalence. The element that immediately captures the viewer’s attention in the work is the splotch of orange acrylic, painted atop graphic inscriptions, in the center of the picture surface. This layer of paint is representational. As the work’s title suggests, it is the setting sun. The translucent quality of the orange sun allows the viewer to see through to the ink scripts, which also surround the sun. The symbolic scripts can thus be interpreted as visual translations of Ekpuk’s memory of Santa Fe. The artist makes use of centralizing symbols in several works, including Memories at Hand (2013), The Traveler (2012) and Take 5 (2013), to subtly direct viewers’ interpretations of his art. He is also adroit in the use of contrast of colors and black graphite or ink in Composition No. 11 (2012), The Thinker (2012), and Indigo Girl(2013). This interplay imbues the works with balance, rhythm, and a sensuous quality that is visually attractive yet uncanny. Composition No. 11 is also a very successful attempt by the artist in focusing solely on the abstract qualities of graphic forms. 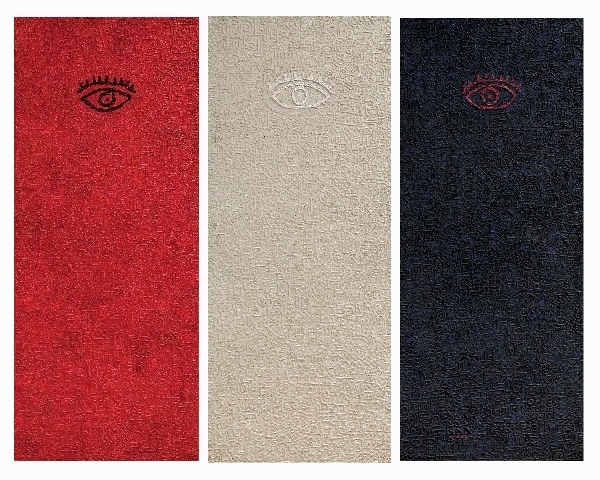 Although works such as Memories at Hand (2013) and The Traveler (2012) are highly symbolic, the key elements in the two works — schematized hand and feet, respectively — bear decipherable messages. State of Being (2012) and Meditations of Memory (2012) address those moments of introspection by the artist as he searched for visual eloquence. Both works also explore Ekpuk’s experience of straddling several cultures. In all, the works are several bodies of interconnected ideas that fit perfectly into an overarching artistic vision from nearly two decades. They represent Ekpuk’s attempt to translate his experiences and the larger human experience, bearing the burden of contemplation, history, and contemporaneity. Victor Ekpuk: Reminiscences & Current Musings, a solo exhibition at Morton Fine Art (MFA), in Washington DC, features selected works by the artist Victor Ekpuk, produced from 1996-2013. 13 September – 8 October 2013. Artist Talk: 28 September, 2013. Ugochukwu-Smooth C. Nzewi (Nigeria, lives in USA) is an artist, curator, and art historian. He is a Smithsonian Institution Fellow and was recently appointed as the curator of African Art at the Hood Museum Dartmouth College, New Hampshire, USA. Nzewi was also recently appointed as one of the curators of the Dak’Art 2014. Pierre Nora (ed. ), Les Lieux de Mémoire (Paris: Gallimard, 1984). Chika Aniakor, “AKA: The Conquests of An Artistic Vision,” AKA 89 [4thannual exhibition catalogue] (Enugu: AKA, 1989), 8.